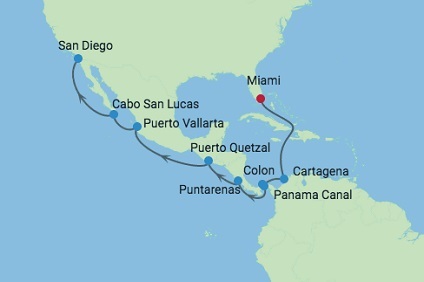 12 Night Cruise sailing from Barcelona roundtrip aboard Celebrity Infinity. 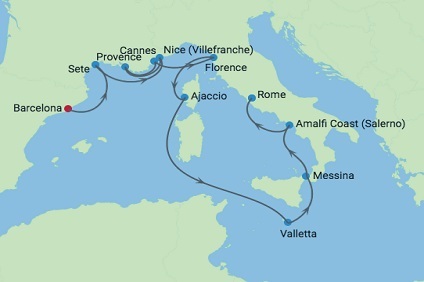 24 Night Cruise sailing from Barcelona to Rome aboard Celebrity Infinity. 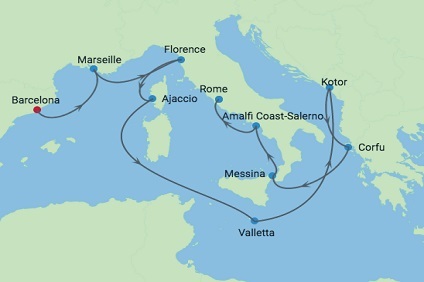 12 Night Cruise sailing from Barcelona to Rome aboard Celebrity Infinity. 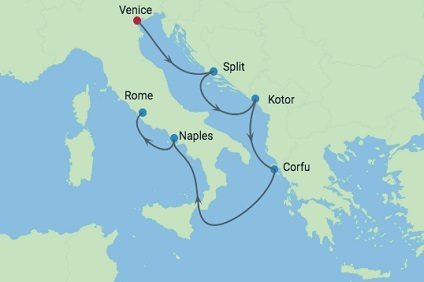 7 Night Cruise sailing from Rome to Venice aboard Celebrity Infinity. 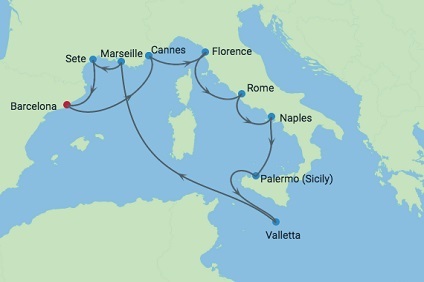 7 Night Cruise sailing from Venice to Rome aboard Celebrity Infinity. 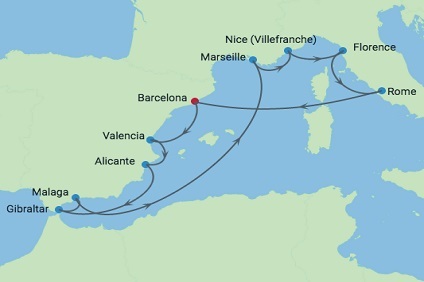 12 Night Cruise sailing from Venice to Barcelona aboard Celebrity Infinity. 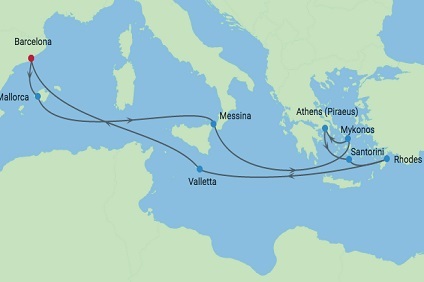 12 Night Cruise sailing from Rome to Athens aboard Celebrity Infinity. 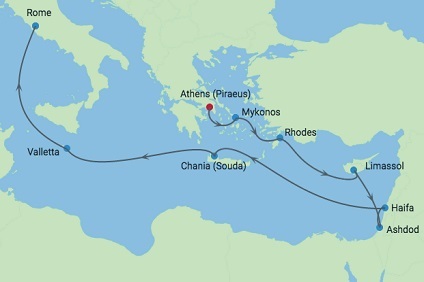 12 Night Cruise sailing from Athens to Rome aboard Celebrity Infinity. 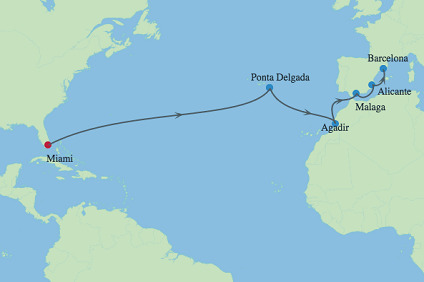 14 Night Cruise sailing from Rome to Miami aboard Celebrity Infinity. 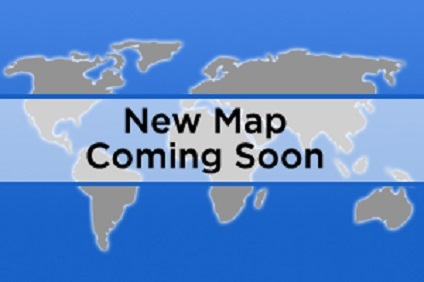 29 Night Cruise sailing from Rome to San Diego aboard Celebrity Infinity. 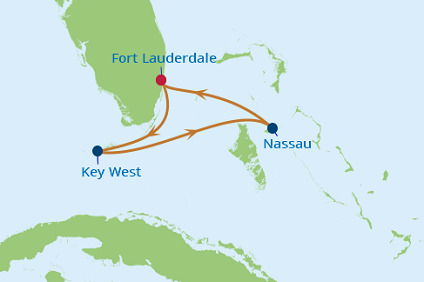 2 Night Cruise sailing roundtrip from Miami onboard Celebrity Infinity. 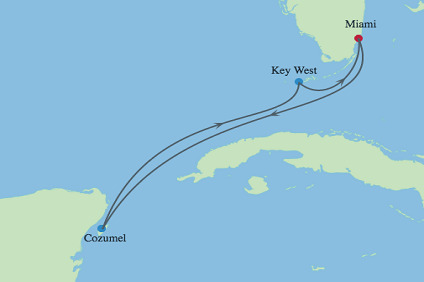 14 Night cruise departing from Miami to Barcelona onboard Celebrity Infinity. Stateroom: 1,432 sq. ft Veranda: 1,098 sq. ft. Features foyer, separate living and dining rooms, baby grand piano, butler's pantry, master bedroom with two lower beds convertible to queen-size, exercise equipment, dressing room with vanity, marble master bath with whirlpool tub, separate shower, powder room with shower, motorized draperies, lights and security system, two interactive audio/visual entertainment systems with TVs, DVD player and VCRs, music center, outbound fax machine, Internet station, veranda with whirlpool, wet bar and lounge seating. Celebrity's Butler Service on Infinity Celebrity's suites include European butler service, a Celebrity exclusive. This service includes: Assistance with unpacking/packing Daily news delivery Full breakfast In-suite lunch & dinner service In-suite afternoon tea service Evening hors d'oeuvres daily Complimentary espresso & cappuccino Shoeshine service Delivery of requested board games Penthouse Suite Indulgences: When you stay in a Penthouse Suite on Infinity, you will receive these added amenities: 24-hour European butler service Priority check-in and departing Priority luggage delivery at boarding Welcome champagne Dining room seating preference PC, printer*, and Internet access** Personalized stationery Celebrity tote bag 100% cotton oversized bath towels Complimentary use of bathrobes Private portrait sitting Opportunity to book in-suite massage *Printer is available upon request. **For a nominal fee. 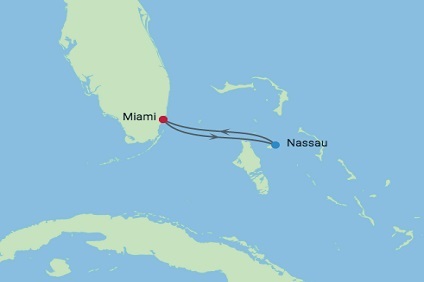 Stateroom: 538 sq. ft. Veranda: 195 sq. ft. Features floor-to-ceiling sliding glass doors, separate living room with dining and sitting area, two entertainment centers with plasma-screen TVs and VCRs, Internet station, walk-in closet, bath including whirlpool tub and stall shower, veranda with whirlpool tub, some suites feature two lower beds convertible to queen-size. Celebrity's Butler Service on Infinity Celebrity's suites include European butler service, a Celebrity exclusive. This service includes: Assistance with unpacking/packing Daily news delivery Full breakfast In-suite lunch & dinner service In-suite afternoon tea service Evening hors d'oeuvres daily Complimentary espresso & cappuccino Shoeshine service Delivery of requested board games Royal Suite Indulgences: When you stay in a Royal Suite on Infinity, you will receive these added amenities: 24-hour European butler service Priority check-in and departing Priority luggage delivery at boarding Welcome champagne Dining room seating preference PC, printer, and Internet access*** Personalized stationery Celebrity tote bag 100% cotton oversized bath towels Complimentary use of bathrobes Private portrait sitting Opportunity to book in-suite massage ***Printer is available upon request. Stateroom: 467 sq. ft. Features two lower beds convertible to queen-size, floor-to-ceiling panoramic windows, separate living room with dining and sitting area, two entertainment centers with plasma-screen TVs and VCRs, music center, Internet station, walk-in closet with vanity table, bath including whirlpool tub and glass-enclosed sitting area (connecting door to adjacent suite). Celebrity's Butler Service on Infinity Celebrity's suites include European butler service, a Celebrity exclusive. This service includes: Assistance with unpacking/packing Daily news delivery Full breakfast In-suite lunch & dinner service In-suite afternoon tea service Evening hors d'oeuvres daily Complimentary espresso & cappuccino Shoeshine service Delivery of requested board games Celebrity Suite Indulgences: When you stay in a Celebrity Suite on Infinity, you will receive these added amenities: 24-hour European butler service Priority check-in and departing Priority luggage delivery at boarding Welcome champagne Dining room seating preference PC, printer, and Internet access*** Personalized stationery Celebrity tote bag 100% cotton oversized bath towels Complimentary use of bathrobes Private portrait sitting Opportunity to book in-suite massage ***Printer is available upon request. All staterooms and suites come complete with private bathroom, vanity area, hair-dryer, interactive TV, radio and phone. A1 - AquaClass All staterooms include: two twin beds that are convertible to queen-size (unless stated otherwise) and sitting area, private mini-bar*, interactive Samsung flat-screen television system to view and select shore excursions, order room service, and watch movies*, private safe, and dual voltage 110/220AC outlets. (195 square feet, veranda 42 sq. ft.) AquaClass services include: daily delivery of bottled water and tea, priority check-in, express luggage delivery, priority disembarkation based on travel plans, and complimentary shoeshine service. Exclusive access to Blu, a specialty restaurant featuring “clean cuisine” that also serves complimentary, full-service breakfast every day. Upgraded room service menu. Amenities included are: complimentary access to the Persian Garden Aromatherapy diffuser, pillow menu, additional bathroom amenities, including shower gel, facial spray and lip balm, Plush Frette® bathrobes, slippers, oversized 100% cotton bath towels, and on-demand wellness programming including meditation and yoga. Stateroom features Hansgrohe® shower panel and fog-free mirror. *Additional charges apply. All staterooms and suites come complete with private bathroom, vanity area, hair-dryer, interactive TV, radio and phone. A2 - AquaClass All staterooms include: two twin beds that are convertible to queen-size (unless stated otherwise) and sitting area, private mini-bar*, interactive Samsung flat-screen television system to view and select shore excursions, order room service, and watch movies*, private safe, and dual voltage 110/220AC outlets. (195 square feet, veranda 54 sq. ft.) AquaClass services include: daily delivery of bottled water and tea, priority check-in, express luggage delivery, priority disembarkation based on travel plans, and complimentary shoeshine service. Exclusive access to Blu, a specialty restaurant featuring “clean cuisine” that also serves complimentary, full-service breakfast every day. Upgraded room service menu. Amenities included are: complimentary access to the Persian Garden Aromatherapy diffuser, pillow menu, additional bathroom amenities, including shower gel, facial spray and lip balm, Plush Frette® bathrobes, slippers, and on-demand wellness programming including meditation and yoga. Stateroom features Hansgrohe® shower panel and fog-free mirror. *Additional charges apply. All staterooms and suites come complete with private bathroom, vanity area, hair-dryer, interactive TV, radio and phone. XA - Aquaclass Guarantee All staterooms include: two twin beds that are convertible to queen-size (unless stated otherwise) and sitting area, private mini-bar*, interactive Samsung flat-screen television system to view and select shore excursions, order room service, and watch movies*, private safe, and dual voltage 110/220AC outlets. (195 square feet, veranda 54 sq. ft.) AquaClass services include: daily delivery of bottled water and tea, priority check-in, express luggage delivery, priority disembarkation based on travel plans, and complimentary shoeshine service. Exclusive access to Blu, a specialty restaurant featuring “clean cuisine” that also serves complimentary, full-service breakfast every day. Upgraded room service menu. Amenities included are: complimentary access to the Persian Garden Aromatherapy diffuser, pillow menu, additional bathroom amenities, including shower gel, facial spray and lip balm, Plush Frette® bathrobes, slippers, and on-demand wellness programming including meditation and yoga. Stateroom features Hansgrohe® shower panel and fog-free mirror. *Additional charges apply. All staterooms and suites come complete with private bathroom, vanity area, hair-dryer, interactive TV, radio and phone. XC - Guarantee Concierge Class All staterooms include: two twin beds that are convertible to queen-size (unless stated otherwise) and sitting area, private mini-bar*, interactive Samsung flat-screen television system to view and select shore excursions, order room service, and watch movies*, private safe, and dual voltage 110/220AC outlets. (191 square feet, veranda 41 sq ft) In addition our Concierge Class includes: Service- Included is priority check-in, priority disembarkation based on your travel needs, personalized concierge service, complimentary shoeshine service, express luggage delivery, main and specialty restaurant seating time preferences, and upgraded room service menu. Amenities- Included are complimentary welcome Blanc de Blancs sparkling wine, fresh fruit, fresh flowers, Plush Frette® bathrobes, oversized 100% cotton bath towels, pillow menu, extra handheld hair dryer, celebrity tote bag, personalized stationary, and use of binoculars and golf umbrella. Stateroom features a veranda and a Hansgrohe ® massaging showerhead. *Additional charges apply. Stateroom: 271 sq. ft. Veranda: 242 sq. ft. Features two convertible lower beds, floor-to-ceiling sliding glass doors, privacy partition, sitting area some with two sofa beds. Features:• Floor-to-ceiling sliding glass doors • Two convertible lower beds and sitting area • Some with sofa bed Note: Staterooms 6108 have smaller veranda that are semi-private. Staterooms 8043, 9034 and 9041 have partially obstructed views. 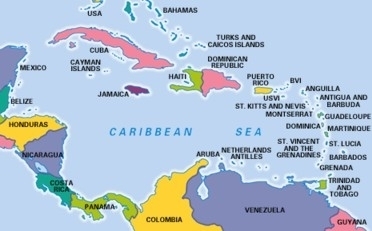 All staterooms and suites come complete with private bathroom, vanity area, hair-dryer, interactive TV, radio and phone. X - Guarantee Veranda All staterooms include: two twin beds that are convertible to queen-size (unless stated otherwise) and sitting area, private mini-bar*, interactive Samsung flat-screen television system to view and select shore excursions, order room service, and watch movies*, private safe, and dual voltage 110/220AC outlets. (170 square feet, Veranda 38 sq. ft) Amenities included are: robe, custom blended bath products (shampoo, conditioner and lotion), shower cap, cotton balls and cotton swabs, water/wine glasses, Celebrity eXhale™ bedding featuring custom premium mattresses, plush duvets and pillows and cotton linens, and hair dryer. *Additional charges apply. All staterooms and suites come complete with private bathroom, vanity area, hair-dryer, interactive TV, radio and phone. Y - Guarantee Oceanview Stateroom All staterooms include: two twin beds that are convertible to queen-size (unless stated otherwise) and sitting area, private mini-bar*, interactive Samsung flat-screen television system to view and select shore excursions, order room service, and watch movies*, private safe, and dual voltage 110/220AC outlets. (170 square feet) Amenities included are: robe, custom blended bath products (shampoo, conditioner and lotion), shower cap, cotton balls and cotton swabs, water/wine glasses, Celebrity eXhale™ bedding featuring custom premium mattresses, plush duvets and pillows and 100% pure Egyptian cotton linens, and hair dryer. *Additional charges apply. Stateroom: 170 sq. ft. Features two convertible lower beds and sitting area with sofa bed. All staterooms and suites come complete with private bathroom, vanity area, hair-dryer, interactive TV, radio and phone. Z - Inside Stateroom Guarantee. All staterooms include: two twin beds that are convertible to queen-size (unless stated otherwise) and sitting area, private mini-bar*, interactive Samsung flat-screen television system to view and select shore excursions, order room service, and watch movies*, private safe, and dual voltage 110/220AC outlets. (170 square feet) Amenities included are: robe, custom blended bath products (shampoo, conditioner and lotion), shower cap, cotton balls and cotton swabs, water/wine glasses, Celebrity eXhale™ bedding featuring custom premium mattresses, plush duvets and pillows and 100% pure Egyptian cotton linens, and hair dryer. *Additional charges apply.